We did it! We finished a marathon! I still can’t believe it! I was really tough but I expected it to be… It took longer than we expected but when I crossed the finish line none of that mattered. 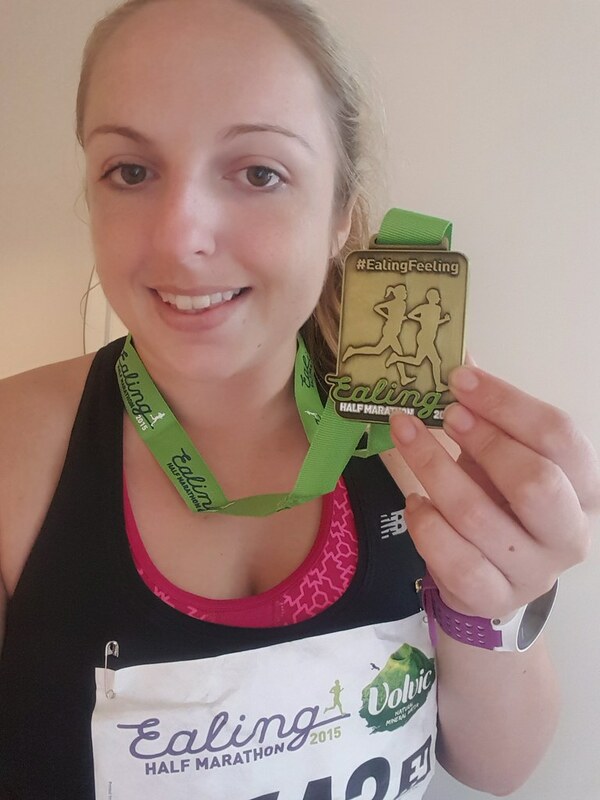 Having moved to London in the summer of 2015 I decided to sign up to the Ealing Half Marathon as my POT race for the Dopey Challenge 2016. 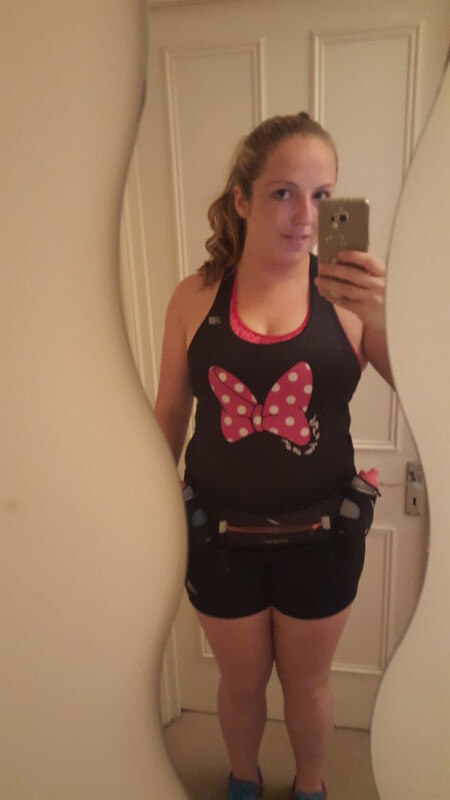 My training in the run up to the race was less than ideal but I did have a lot of mileage under my belt so I knew I would make the distance, my challenge was going to be making the time I wanted. I decided about a month out that I didn’t really fancy running this one alone so I roped my Dad into coming over from Dublin to run with me! New PR: My last half marathon was Wine and Dine Half in November 2014 completed in 3hrs01min14secs. I wanted to set a new PR at this run and I was more than capable of doing it by a long shot. Goal A: Finish the race at 2hrs25mins in order to equal the POT set by Dad and Rachel at the Dublin Rock ‘n’ Roll Half. Goal A+: Beat that time! Dad and Rachel ran their half over a month before this one and actually ran a training run completing 13miles in about 2hrs21mins. The evening before the race we went out for Italian to get some carbs in, got back to the flat early and chilled out while watching England vs Wales in the Rugby World Cup. 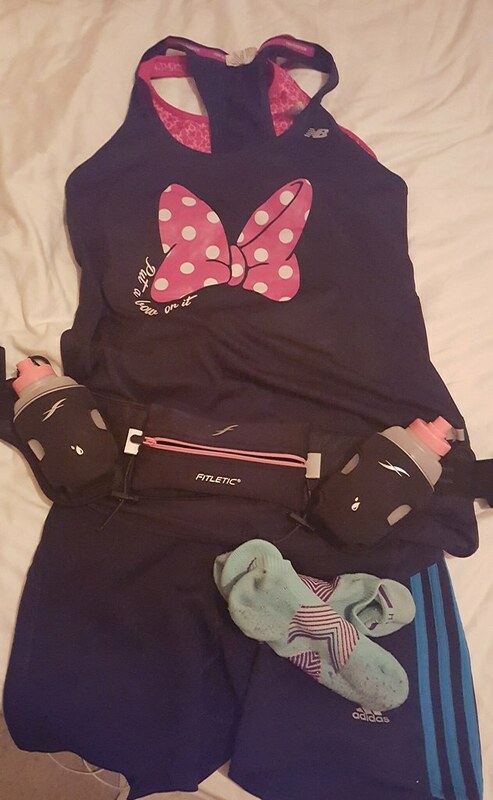 I lay my running outfit out for the next day and got to bed at a reasonable hour. We were up EARLY on Sunday morning, I had my usual bagel with peanut butter and we caught the first tube running from my area in North London. I drank half a poweraid on route and some water. The other fuel we had packed was two GU gels, cliff blocks and a banana. I had two cliff blocks before the run and my Dad had a banana. We were delayed on route due to a signal issue at one of the stations and arrived and Lammas Park just as the warm up was starting. 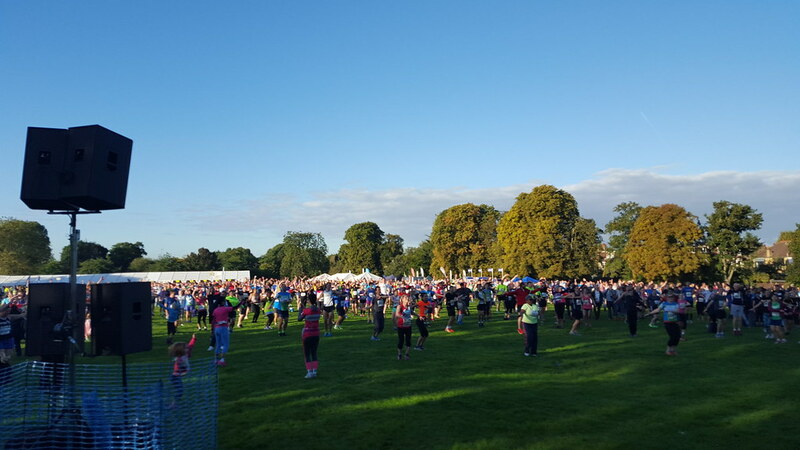 We proceeded to the start line and took a quick toilet break with again a very short wait as there were plenty of toilets. We hopped into the 2hrs 20mins finishing group and noticed that we were a VERY long way towards the back of the pack. There wasn’t really all that many people behind us. 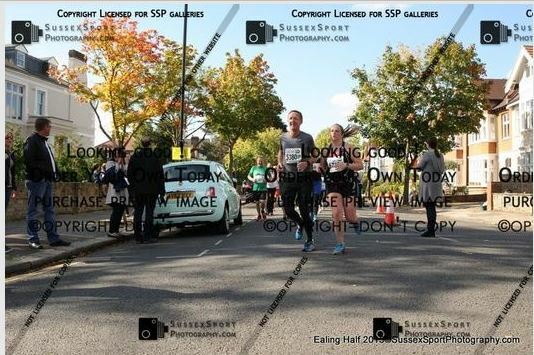 This was a lovely little boost and he really made an effort to catch us several times along the course. I had programmed 4:1 intervals on my Garmin for today. I decided as we started that we would run through the first walk break so we’d be running 9mintues straight which should get us to around the 1mile marker before we took a walk break. 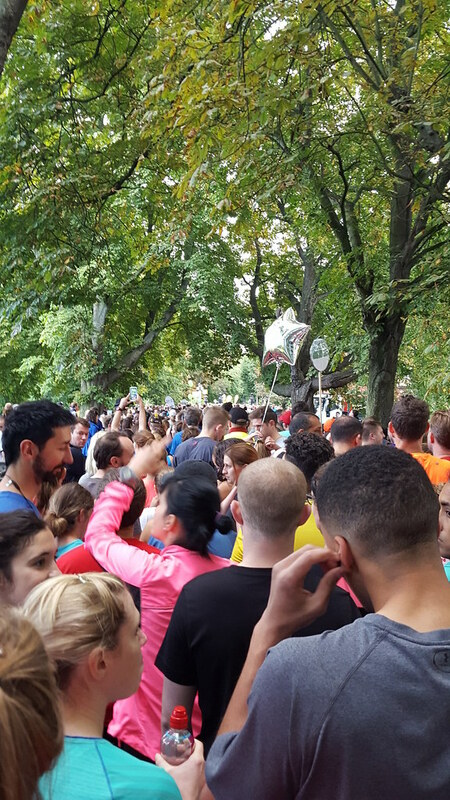 I must mention straight off the bat that the crowd support was fantastic today, there were people cheering along the whole route and it was a really positive atmosphere. For the first time in a race I decided to wear earphones, I was listen to MickeyMiles podcast as recommended by others in the marathon forum. Shortly after we started my Dad felt something in his shoe, it felt like a stone so he decided he was going to have to stop. He told me to leave him behind and he’d catch me to continue my run walk breaks as normal. I pulled my phone out and saw that PC was watching along the course already and told me he was by an ambulance. I had originally said to him to go to the out and back at mile 6&10 but he’d apparently crossed the course when looking for somewhere to park so got out in the hopes of seeing me and wouldn’t you know just after I checked my phone I looked ahead, saw and ambulance and he was right at it just after the 1mile mark. I ran up towards him waving and saying that my Dad was behind me somewhere and he shouted lots of encouragement as I went passed. Well I continued running and came round a corner and he’d managed to drive the car round and was beeping and shouting for me some more so I had the biggest smile on my face! I started to get a little worried then as it had been about 5mins or so and my Dad had yet to catch me up (he’s way faster than me when I’m not holding him back). I thought maybe when I’d pulled over for PC or been distracted by the beeping he could have went past me and he’d no phone on him either! Luckily he caught up with me around then and we continued on with our intervals. One thing I hadn’t been prepared for this race day was THE SUN. It had been cloudy leading up the race and when I checked the weather report I saw nothing about sunshine but the sun was already up and although it wasn’t too hot it was really bright and it was already starting to give me a bit of a headache. Note to self: invest in sunglasses or a good visor…. I think I’d rather sunglasses. I was careful to keep well hydrated, I had Poweraid in one of my 8oz bottles and water in the other that I refilled at every water stop. The water stops were great and we were given small bottles of volvic which were really easy to drink from. There was a stop just before mile 2 so I grabbed a bottle, drank a bit and spilled a little over my head too. Then I remembered I had earphones in… whooops. My Dad had taken a look at the course beforehand and said that it wasn’t that hilly, it apparently looked better than the 10mile we’d completed in August. WELL…. that was so NOT the case. There were so many HILLS OF DOOM it was ridiculous. I had completed a lot of my training runs since moving to London on the treadmill so these hills were super tough for me. One of the lads I play tag rubgy with lives along the course so I text him from the course and sent my location and wouldn’t you know I was only a few minutes from him house. I got a great cheer as I went passed which was nice! We continued with our intervals and stuck pretty well to them for the first 4miles or so. Around then I had to stop on one or two hills and take an extra bit of a walk as my muscles were on fire and I didn’t want to risk hitting a wall before the end. I had messaged PC to ask him to have poweraid for us that we would collect at Mile 10. I was also expecting to see PC soon so when it came to a walk break we continued running as I wanted to be running when he saw me! Sure enough we passed him soon after but he wasn’t at the out and back which was further on the course, he tried to hand us the poweraid and seemed very confused when I said not now! I still had poweraid in my waist belt so we would’ve just had to carry the bottles. Just passed the 6mile mark we took an extended walk break to have some cliff blocks and extra water. I HATE OUT AND BACKS. It’s just hard when you’re running in one direction and the people on the other side are like 4miles ahead of you. 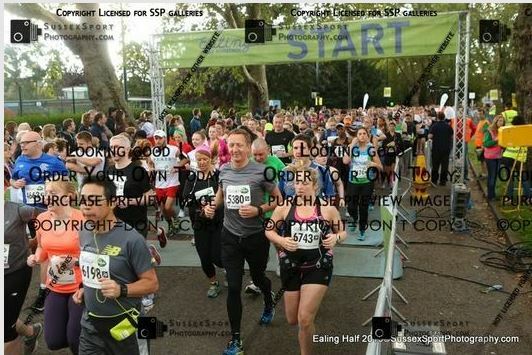 I must mention at this stage that the whole time we had been running we were in and around the 2hrs20 pace group. We would pass them when we ran and they would pass us when we walked. They were never out of sight. Also the people cheering for us would cheer for our group like ‘yah go two twenties’ and stuff like that which was fun. Also another thing to mention was that we passed A LOT of people. 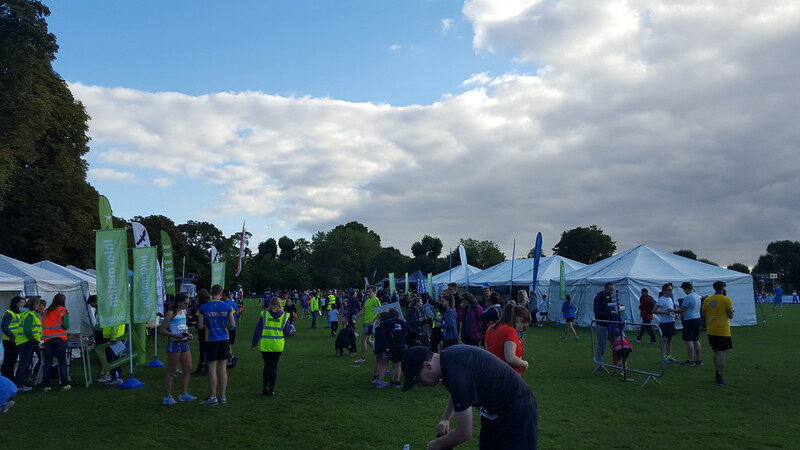 I definitely think a lot of runners had placed themselves in higher pace groups than their natural fit but it didn’t cause us any issues as the course was well able for the crowds. I sent a text to PC explaining the poweraid situation and shortly later he messaged to say he around 10mile mark. We seemed to go pretty quickly through the out and back but there was one hill that HURT LIKE HELL. I was starting to struggle a bit to keep up all of our intervals. We passed mile 10 and I hadn’t seen PC so I text again and sure enough I see him in the distance as we’re on a walk break but he hadn’t spotted us so I took off and we ran up to him. I gave him a hug this time and took the poweraid and he shouted more encouragement and clapped for us as we ran off. Around about mile 11 I was hurting. My legs were struggling and I felt a lot of pressure to get the time we wanted. It was probably the worst I’ve felt in a race. We kept pushing through and made it to 12 and that’s when I full on DIED. Hit a wall like I’ve never hit before. I normally get a massive kick in the last section of a race but I was struggling today and I was so incredibly frustrated with myself. 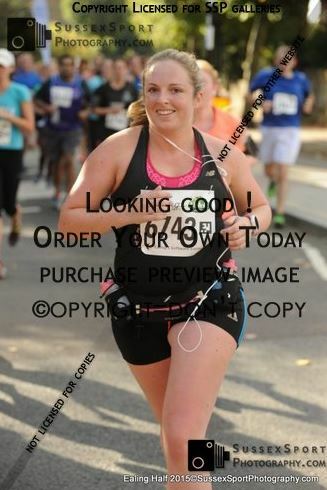 The photographers on the course got lots of pictures of us and unfortunately 70% of them we in this last mile. 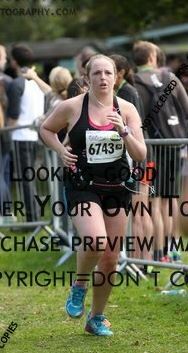 I normally smile and wave at the camera but at this stage it was taking everything I had to get the finish. 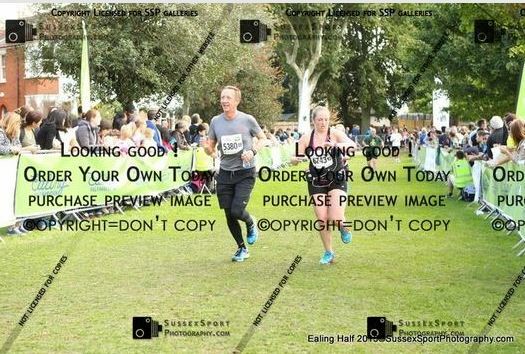 My Dad was great and was pushing me to keep running. FINALLY I did it… crossed the finish line…. I have never been so relived for a race to be over! Funny thing was… I felt OK afterwards. I wasn’t really out of breath or anything but my legs did feel a bit jelly like. I’m not sure what happened in that last mile but I do know that I managed to push through. I think I really felt the time pressure today. I find it so much easier to enjoy a run when I’m not putting pressure on myself to finish by a certain time. Luckily that’s the last race I have a time goal for. 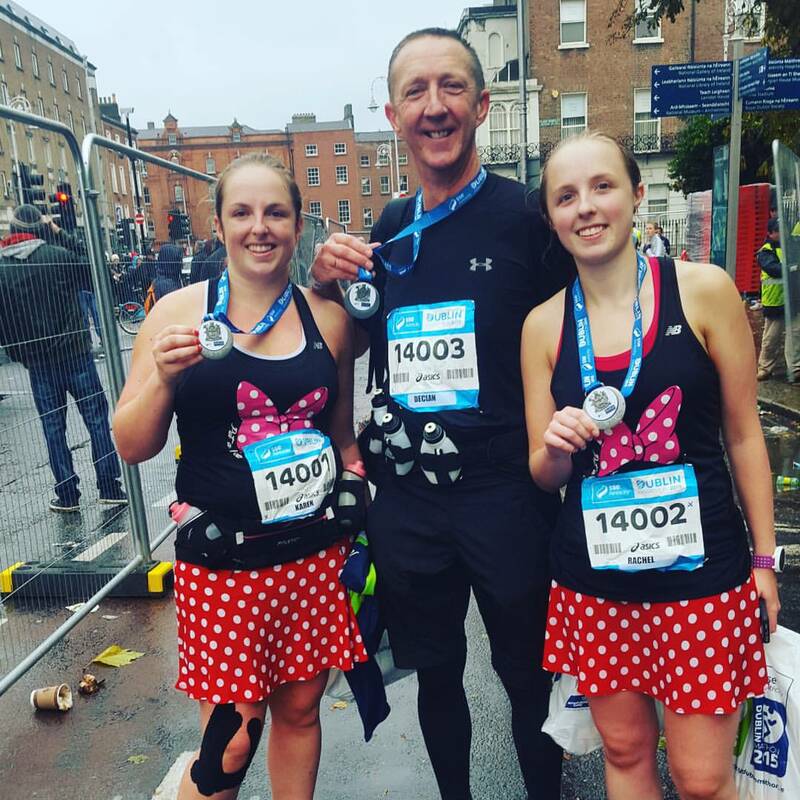 The Dublin Marathon and Dopey are all about finishing. Overall it was a well organised run. There was great support on the day, plenty of water stops, baggage drop off went smoothly and the course was scenic and had lots of space. One slight thing to note which is more relevant to being a spectator was that a lot of the officials didn’t know where they were on the course, so when PC asked what distance he was at if he wasn’t at a mile marker they weren’t able to tell him so my advice to anyone spectating is to check the course map in advance so you can let the runner know where you’ll be. The volunteers on the day were all amazing and did such a good job at cheering for us as we passed, handing out waters and even sweets at times. Apart from Wine&Dine where the volunteers were out in the rain and still cheering the volunteers here were the best I’ve experienced and there were so many of them too. Looking at my stats from my Garmin I must have done a bit of extra weaving as my distance was slightly more. I took a good 10seconds or so to stop my watch as well after we finished. I met all three goals that I set myself, we finished under 2hrs20mins and really all we ‘needed’ to do was finish under 2hrs25mins as that is the time my sister submitted so we will be dropping to her coral if necessary. It was a HARD run for me but I feel stronger for having still achieved my goals.